I’ve read and loved the Percy Jackson books,so this book fictitious mythological book was very high on my to – read list for a long time. Since their mother’s death, Carter and Sadie have become near strangers. While Sadie has lived with her grandparents in London, her brother has traveled the world with their father, the brilliant Egyptologist, Dr. Julius Kane. One night, Dr. Kane brings the siblings together for a “research experiment” at the British Museum, where he hopes to set things right for his family. Instead, he unleashes the Egyptian god Set, who banishes him to oblivion and forces the children to flee for their lives. Soon, Sadie and Carter discover that the gods of Egypt are waking, and the worst of them–Set has his sights on the Kanes. To stop him, the siblings embark on a dangerous journey across the globe — a quest that brings them ever closer to the truth about their family, and their links to a secret order that has existed since the time of the pharaohs. A pair of brother and sister are suddenly pushed into a world of Egyptians gods and magicians and they have to race against time to..you guessed it..save the world.. The switch between narrators gets monotonous after a point.. This book is like the Percy Jackson books with respect to the ending..you defeat one obvious bad guy to realise a bigger baddie hiding behind to facilitate the making of a series of books.However this is where the similarities end between the two series. 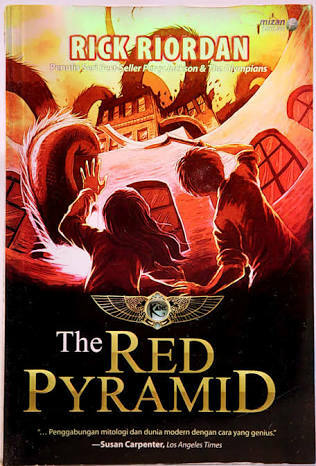 I did not did not find The Red Pyramid aren’t as enjoyable or engaging as I wanted it to be.Lovers of Egyptian mythology or fans or Rick Riordan can read this one.Others can give this one a miss.